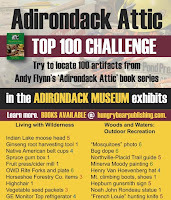 The Adirondack Attic Top 100 Challenge (download PDF) has been updated and is ready to be used. I only had to fix two objects. I recommend using this scavenger hunt at the Adirondack Museum with the six "Adirondack Attic" books in hand. Although the books are not necessary to find the objects, they make it easier and give more meaning to the artifacts than the small signs in the exhibits. 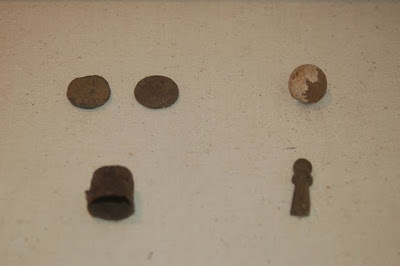 Dawn and I were able to find the 100 artifacts within a few hours on Sunday; however, you will need more time to enjoy the hunt and learn about the history. I'm already familiar with them, so it doesn't take me as much time. 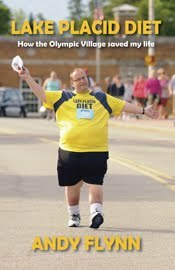 Buy the books on this website or directly from me. They are no longer available at the Adirondack Museum gift shop. We found six copies on the sale rack, but I assume that once they're gone, the museum will no longer carry my books. It's a shame, since the books are about the museum. So if you want to buy a copy of Volume 1, which is out of print, there's one for sale at the museum gift shop for 50% off the retail price of $16.95. That's a bargain. The other five are 30% off. The Adirondack Attic Radio Show segment about artifacts found at Pike's Cantonment, a War of 1812 winter camping site for the American army during the winter of 1812-13, aired on North Country Public Radio Tuesday, Sept. 4. 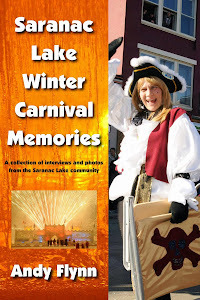 Listen to the show on the Adirondack Attic page at ncpr.org. Here is a photo of the artifacts discussed in the program. Thanks to Battle of Plattsburgh Association President Keith Herkalo and the War of 1812 Museum in Plattsburgh for their hospitality during the taping of the interview on Aug. 16. In addition to Whiteface Mountain in Wilmington and a historic hill in Ticonderoga called Mount Defiance, Prospect Mountain near Lake George is the only other mountain in the Adirondack Park where you can drive your car to the top. However, Prospect Mountain was the only one in the Park with a railroad built to its summit. In 1954, New York Gov. Thomas Dewey signed legislation creating the Prospect Mountain Veterans Memorial Highway but did not include a means to pay for the construction. In 1966, New York Gov. Nelson Rockefeller signed legislation approving the funding, and the road opened to the public in 1969. The New York State Department of Environmental Conservation operates the road, which is open from May to mid-October. In September 2008, curators at the Adirondack Museum acquired a memento from the heydays of Prospect Mountain, at a time when there was a hotel on the rocky summit. 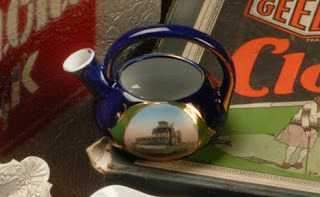 The museum now has two souvenir china pieces, both made in Germany for the Adirondack tourist trade, which feature color paintings of the Prospect Mountain House on the front. One is a small teapot and the other is a small vase. Both are several inches tall and can be lumped into the knickknack category. In addition to the illustrations, they are painted blue and green with gold accents. In the summer of 1895, a 1.4-mile “cable road” or “incline railway” brought travelers from the village of Caldwell (later changed to Lake George) to the top of the mountain. The Prospect Mountain House featured a restaurant, billiards, a bowling alley and a rifle range. By the turn of the century, the railway was declining in popularity. In 1902, the Otis Engineering and Construction Company acquired the railway and operated it through the 1903 season. George Foster Peabody bought Prospect Mountain in 1904 and subsequently gave the land to the state of New York. Iron gears from the Otis cable road remain on the summit today, and part of the 1.7-mile hiking trail from Lake George village to the top of Prospect Mountain follows the old railway bed.